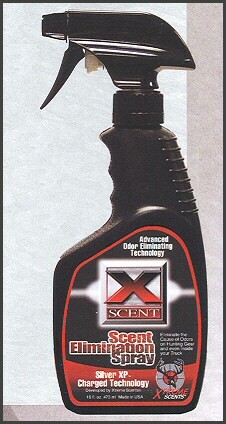 X Scent’s Scent Elimination Spray with Silver XP technology developed by Xtreme Scents is the most technologically advanced scent eliminator spray on the market. This spray is chemically blended with activated charged silver ions, which eliminate odor-causing bacteria. This anti microbial technology prevents the growth of bacteria for more than 48 hours, giving hunters a new sense of confidence and the ultimate advantage to go undetected. X Scent’s Silver Scent Elimination Spray also contains Xtreme Scents original Scent Eliminator chemical, which will eliminate other odors not caused by bacteria, such as gasoline vapors, food smells and smoke. Available in: 16 ounce spray bottle Please note: Due to the extra weight of the Product additional shipping charges will apply. These charges will be added to your Visa - M/C purchase.